VATICAN CITY – Pilgrims gathered in St. Peter’s Square to mark the third anniversary of Pope John Paul II’s death remembered him as a man of peace and a pastoral father who inspired a whole generation of young people around the world. Tens of thousands of people of every age and nationality attended the April 2 outdoor memorial Mass with Pope Benedict XVI. Banners and flags, many of them representing Poland, fluttered in the gentle breeze under Rome’s warm spring skies. Pope John Paul “really felt like a father figure, and the way he loved Christ inspired me to love God more,” said Carolina Robles, 25, of Lubbock, Texas. She told Catholic News Service that the late pope convinced her that committing oneself to God was something that every young person could and needed to do. “Being young, he made me think I could do that and not wait until the end” to follow Christ, she said. “He knew young people had a yearning for God in their hearts,” said Robles, one of a small group of graduate students of theology studying in Rome this spring. It suddenly felt like this “pastoral father who had watched over me my whole life” and “who had personally cared for me wasn’t there anymore,” said Schietinger, 22. The late pope was popular in part, he said, because people saw him as a man who practiced what he preached. “He was a man who suffered under communist rule, who was true to himself even during persecution. What he believed and what he did were united, and I think people feel that when someone is true” to his or her beliefs, he said. He always urged young people to not be afraid “because God is with you, Jesus needs you. So I think that’s why the youth loved him,” he said. “His joy and love were contagious,” said the 26-year-old from Dallas. 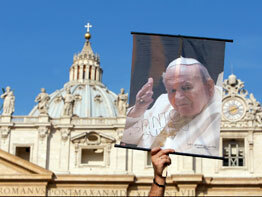 Many pilgrims said they were happy Pope John Paul’s sainthood process was going forward. Teresa Deeble of Essex, England, said the pope, who always prayed for peace, deserved to be honored in such a way. Nikki DeMarco and her husband, Anthony, who reside in Vicenza, Italy, said they did not think the canonization process was going too slowly. “In this world of instant gratification, it is nice some things take awhile,” she said. Janice Gregory Luppen of Wasilla, Alaska, said coming to St. Peter’s Square for the memorial Mass was the high point of her first trip to Rome. She said she grew up “in the bush” in Alaska and that her mother was extremely devoted to Pope John Paul. “She put him up there right with St. Peter,” she said. Ms.Luppen said the pope gave the world a message of “peace and good will,” but that growing up in a place that had no church meant her only real reference point for what the pope stood for was through her mother. “There were 10 people in our family and a priest came once a month. We had church in our house and confession in the bedroom,” she said. “I never dreamed in my life that I’d be here” in St. Peter’s Square, she said, laughing.